It took me a little while to warm up to Nicki Valentine but, once I did, I had a great time sleuthing around with her. Maybe it wasn’t so much Nicki that I was feeling uncertain about, but rather the subject of her search. Dealing with adoption and foster care for The Day Job means that I sometimes don’t respond the best to stories involving adoption and foster care when I’m away from work. 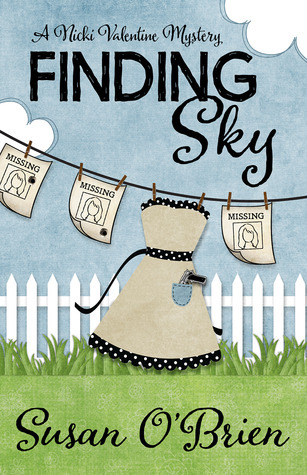 But Susan O’Brien’s story is about so much more and I was very soon caught up in the mystery of Finding Sky. Widowed mom of two, Nicki Valentine knows how much her best friend Kenna dreams of having a child of her own. Unable to do so, Kenna and her husband, Andy, are in the process of adopting a baby from birth mom Beth. Beth, however, disappears one day and Kenna asks Nicki – a PI student – to find the teenager. Nicki quickly finds herself in over her head, dealing with rival D.C.-area gangs, shady characters, and nosy (or not-nosy-enough) neighbors. Nicki very much wants to help Kenna – and Beth – but it might just be at the expense of her own children . . . or her life. While Nicki leads the charge to find Beth, she isn’t alone on her mission. Her class instructor – the handsome Dean – is guiding Nicki and helping out, as well. Nicki’s mom provides child care and a handful of neighbors and friends flesh out the mystery. I liked Dean, but I don’t feel very connected to his character. I wish there were more personal scenes between he and Nicki in order to amp up the romantic tension and feelings there, rather than simply being taken there by the end of the book. I did, however, like the number of supporting cast members that the author included – enough to fully populate the canvas, but not so many as to lead to confusion. In all, a good start to a cozy series! I enjoyed the story, the characters, and the plot.